Available information extracted from a speech by the former National President in 1963, Mr. K. A. Ofosuhene indicated that the Union began at Akuafo Hall Chapel of the University of Ghana on the 22nd of November 1959 with thirty-nine students. The inaugural ceremony was held at the Legon Hall at 3:00 pm of 28th February 1960. The chairman was Rev. W. S. Robertson of the University of Ghana. Present were the Moderators of the two Presbyterian Churches; (EPCG). Also in attendance was Rev, A. L. Kwansa; Synod Clerk of PCG. The first branch President was Rev. E. S. Mate-Kodjo (later synod clerk of the PCG 1985-1995). Among the founding fathers of the Legon Union were Messrs Patrick Asare, Puplampu, S. A. Preprah, John Amponsah, O. K. Caeser, C.R. Garba and Kwamena Poh. Others included P. V. Akoto, D. N. A. Nortey, Damalie , K. A. Ofosuhene and others, with the late Rev. Prof. Emeritus C. G. Baeta as their patron. 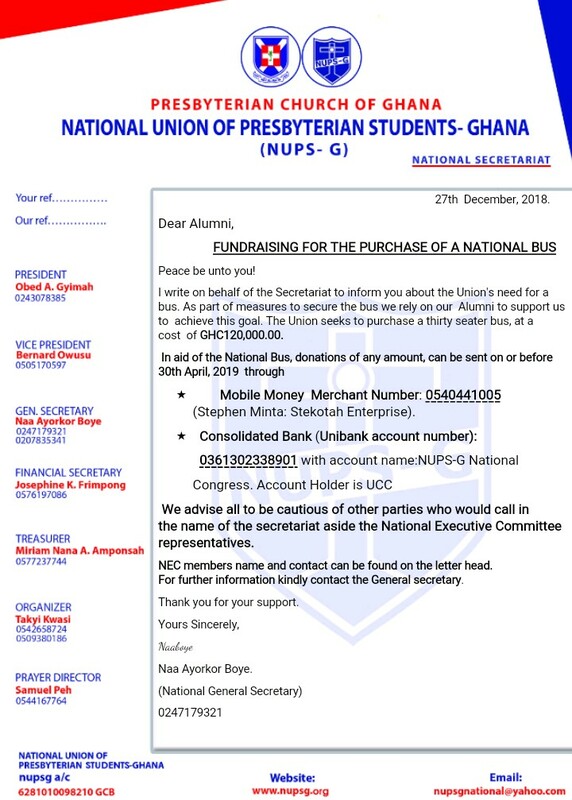 The idea of NUPS-G spread to other institutions and in 1962 the first National Conference was held at the Commonwealth Hall of the University of Ghana. The second National Conference was held at Winneba Training College (now Abetifi Training College, Abetifi-kwahu) and Krobo Training College, Odumase-Krobo. The Conference was chaired by the then National President Mr. K. A. Ofosuhene. The main issue of discussion was a draft constitution prepared and presented by Mr. D. N. A. Nortey; the National President (now retired Professor and former Dean of the faculty of Social Studies, University of Ghana). Among the National Leaders in its formation years were Mr. D. N. A. Nortey now Prof. (1961/1962), Mr. K. A. Ofosuhene (1962/1963), S. A. Ocansey (1963/1964), Mr. A. A. Beeko former Moderator of PCG (1964/1966), Mr. D. A. Dartey former General Secretary of the Christian Council of Ghana, (1967/1968), Mr. E. Y. Boakye (1969/1970), Mr Seth Baah Now lecturer at the College of Art, U.S.T., Kumasi, (1970/1971) and Mr. I. A. Forkuo former Inter Church and Ecumenical Relations Secretary of the PCG. Since the 1960s the NUPS-G has been involved in getting her members to be active in church services. In this vein, the Union is involved in a lot of activities geared at achieving this aim. One main area has been the organization of Leadership Training Programmes. The first leadership training was held at Trinity College on 26th January 1985 for the four coordinating branches. One other major activity has been the Student-In-Church-Evangelism (SICE). This has afforded members of the NUPS-G the opportunity to Share the Gospel of Christ with many people in deprived areas of the country. During this SICE programmes revivals, witnessing, crusades, healing, deliverance and counseling sessions have been the main features. NUPS-G has also been involved in voluntary work camps where free manual services have been placed at the church’s disposal. Example of these were at Kwahu Nkwatia, in 1985, building of a school, Kwawu Tease, in 1986, the constructing of a church building in Chirapatre, Kumasi, in 1957, digging the foundation for the construction of a water tank (one day programme at a National Congress) and the last work camp in Abokobi 1999, construction of chalets (joint programme with German Youth). The Union has also been involved in the Publication of articles in her mouth piece “THE NUPS-G OBSERVER”.